Fiji is an awesome place with beautiful islands, friendly and fun people, a vibrant native culture and some of the best diving in the world. Jacques Cousteau coined it the Soft Coral Capital of the World (more on that later) and that name has stuck and given Fiji much of its diving identity although it’s not always accurate. Fiji is safe and relatively modern for a developing island nation and the cost structure is moderate so it’s a good value. Fiji also has over 300 islands and a striking amount of diversity both above and below the water. Oftentimes people talk about Fiji as a homogenous place and that’s not the case. The diving is highly varied depending on where you go and even the cultural background of the local people that you will meet. The main island, Vitu Levu is large – over 90x60 miles and mountainous as is the second largest island, Vanua Levu. The outer islands vary from idyllic sand spits to mangrove fringed. The first time we went to Fiji, we spent over a month and still had plenty left to see. Fiji’s department of tourism has done its homework and made Fiji one of the easiest places to get to for diving in the Pacific. Flight schedules are perfect and fares on the national airline, Air Pacific, are very reasonable. Fiij is quite easy to get to from the USA. Typically, you fly out of LAX on Thursday night which gives you all day to get to LAX even from the East Coast. West Coasters could even put in a half day at the office! You fly thorough the night, get some sleep and arrive at 5:30AM into Nadi on the west coast of Viti Levu, the main island. If staying there, you simply transfer to your hotel or meet your liveaboard. You cross over the international dateline along the way so a Thursday night flight gets you into Nadi for Saturday AM. On departing, you fly out on Saturday night from Nadi, arriving into LAX at 1:00PM on Saturday – remember you get the day back you lost going back over the dateline - which lets you catch connecting flights. If flying to one of the outer islands, the domestic terminal is right next door to the international arrival hall and island flights are usually less than one hour. You arr relaxing in your beachfront bure by noon. Despite what you may have been told, soft corals are NOT everywhere in Fiji – you need to go to specific areas. Likewise, there are some stunning hard coral reefs in Fiji that nobody talks about, great macro, some good pelagic life and the best shark dive in the world. 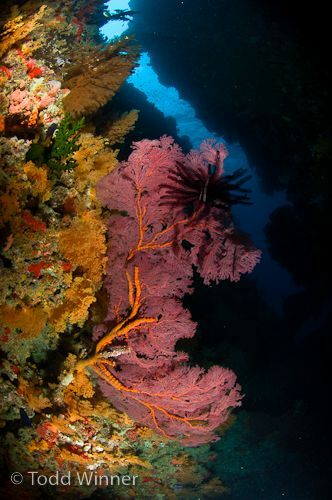 The gorgeous, lush, color splashed images of Fiji that you see are courtesy of a soft coral called dendronephthya. 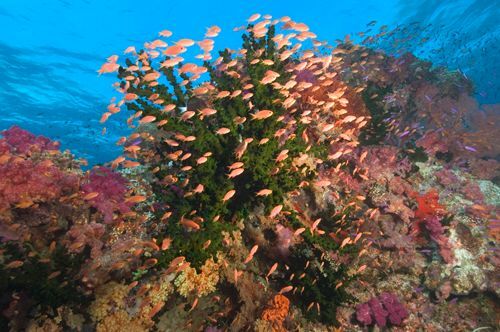 Few other places in the world other than the Red Sea and PNG have dense patches of this coral and it covers the reefs in Fiji in fiery purple, pink, orange, red and yellows. There is also another beautiful soft coral called siphonogorgia that is abundant in some areas in Fiji. Dendronephthya needs current. With little current present, the soft corals are muted, but as the current increases, they inflate with water and their color really begins to shine. Also as the current picks up, planktivores such as beautifully colored scalefin anthias spring up off the reef in polarized schools. Together, this forms a rich pageantry of color. So as underwater photographers, we want to be aware of these phenomena and shoot whenever possible when there is at least some current present. It makes a dramatic difference in the color of our imagery. The best places for soft coral in Fiji are the Bligh Waters between Viti Levu and Vanua Levu where there are numerous reefs and pinnacles, the Somosomo Straight between Taveuni and Vanua Levu and Namena Island and its marine protected area. Bligh Waters: this area is off the northwest coast of Viti Levu and is the passage between that island and Vanua Levu. It’s accessed by liveaboards or resorts in northwest Viti Levu. It may have the best soft corals in Fiji, some fantastic pinnacles and even pelagics. 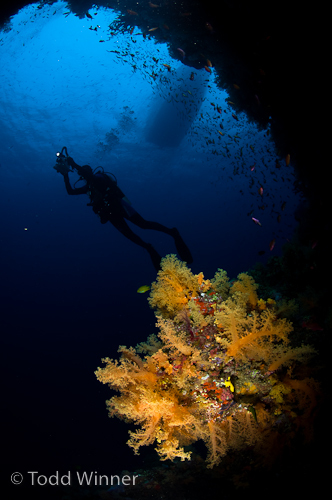 It has dive sites such as E6, Mount Mutiny, Black Magic Mountain, Express and Lost World. This is the passage between Taveuni and Vanua Levu. It is accessed by liveaboards and land based dive operations from the west coast of Taveuni. It has dive sites such as the Great White Wall and Blue Ribbon Eel Reef. Great Sea Reef/West Vanua Levu: this is one hour boat ride off the west coast of Vanua Levu. 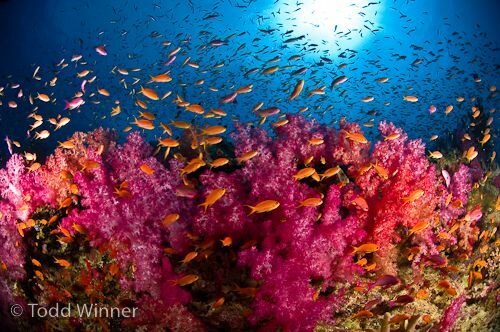 It is a beautiful hard coral reef with good fish life. In the winter time, it can see big swell. It is accessed by Nukubati Resort on the west coast of Vanua Levu near Labasa. There are dive sites and pinnacles scattered along the eastern coast of Vanua Levu including some nice hard coral reefs. It is accessed by resorts on the east coast of Vanua Levu. Namena is accessible from here although it may be a 1 ½ hour boat ride. If you’re diving here for an entire week, you’ll need to repeat some sites. Namenalal is a small island with a surrounding reef off the southeastern tip of Vanua Levu. It has one resort, Moody’s, and its founders have worked with local Fijians to create a marine reserve. The reefs that encircle the island have soft corals, good fish life and some pelagic life. It has dive sites such as North Save a Tack and South Save a Tack. It is accessed by liveaboards, the one local resort or from the east coast of Vanua Levu. Beqa is a large island located off the southern tip of Viti Levu. It sits within a lagoon and is surrounded by reefs. The diving here can be accessed by resorts on Bequ or Pacific Harbour - which is the town on Viti Levu opposite Beqa. Since the lagoon faces the big island, three major rivers run into it from Viti Levu and during periods of heavy rain can create poor conditions for diving in the lagoon. The rainy season is not recommended here. Beqa has patch reefs and small bommies, some of which are festooned with soft corals. The best diving is near the island of Yanuca. Beqa has the best shark dive in the world where you have the opportunity to see seven species on one dive including numerous large bull sharks and even a tiger shark. The action is intense. Not for the fainthearted. This group of islands has the best beaches in Fiji. Unfortunately the diving isn’t the best as well. If you’re coming for diving, best to choose a different area. This seldom visited group is in the far north of Fiji. 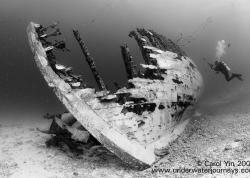 It is difficult to obtain permits to go here and there are currently no liveaboards servicing it. It was profoundly affected by a large bleaching event and it is unclear how much the coral has bounced back. 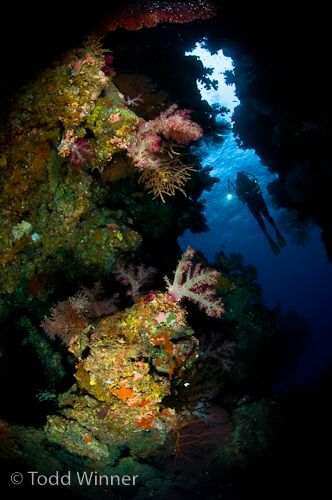 The majority of diving in Fiji is done as drift dives allowing you to cover large distances to see walls of soft corals. Current is your friend in Fiji, it brings out the soft corals and wildlife tend to pile up on the current side of boomies. So when the divemaster says “There’s going to be currant on this dive” the appropriate response is “yahoo!! Bring it on!” and when the divemaster says, “no current” the appropriate response is “then let’s go find some!” As a photographer, you may wish to bring a reef hook, then you can find a spot with beautiful colors, hook in and shoot to your heart’s delight! The water is never cold so most divers will be happy in just a 3mm wetsuit. Always have a safety sausage so the tender boat can see you when you surface. Cool things to see and shoot in Fiji. In Fiji, it’s really all about the corals. The colors are so incredibly vibrant and the anthias SO plentiful and beautiful it’s hard to ever look away and around every corner is the next world class image. Remember to get in there in the current. 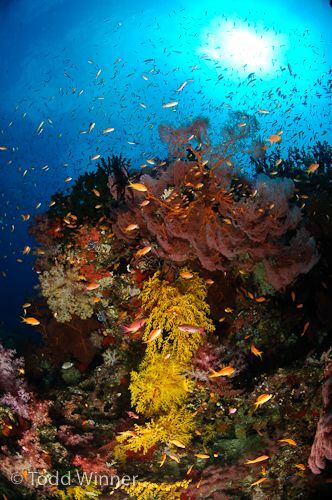 One of the main draws of diving Fiji are the reef scenics - and they are spectacular. Fiji is also home to fantastic anemone fish including one endemic species. Often they live in colonies on the tops of the pinnacles and make great subjects. Blue Ribbon Eels are fantastic subjects. The yellow and blue males are full of personality and if you search hard you can find the female (all yellow) and the juvenile (black with a yellow stripe). The black juvies are difficult to photograph. Sharks- Sharks do exist in Fiji though they are not found on every dive. The most common species seen are grey-reef, silvertip, hammerhead or white tip reef sharks. Sharks always make great subjects, but reef sharks are difficult to get close to. Banded Sea Snakes- The banded sea snake is found in the Fijian waters on occasion and is really fun to shoot! There's decent macro, although it is not as good as the great macro in the golden triangle of south-east asia. 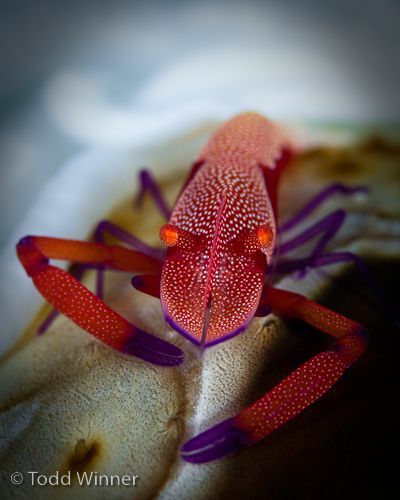 Mantis shrimp, small crabs, imperial shrimp, other small shrimps can be easily found. June through October is the dry season. During that time, the water is clearest (100’+) but it can be windy and water temps can drop into the mid 70’s. The wet season runs from December to April. During that time, the winds die down, and visibility is lower but still typically quite good (60’+) and water temps are in the low 80s. Hurricane season is December through March. The transitional months of November, April and May might be the best times to go. Also keep in mind that weather can be different on different islands. The jungle mountains of Viti Levu top out at over 4000’ and create their own weather. Quite often, clouds form by the afternoon and are dissipated as early AM rainshowers. The northern part of Viti Levu usually has clearer weather than the south. Dry season – mid 70s. Wet season – low 80s. Depends on season and location. Often 100’+ outside lagoons in the dry season. The Bligh Waters can have high visibility even in the wet season, 80-100ft. The use of a reef hook is a great way to photograph in Fiji. The tops of the pinnacles or bommies usually host a plethora of life. Just hook in and shoot as the current blows you around. Fiji is quite often about wide angle and this is a great place to dial in your wide angle shooting. This is also a fun place to play with a fisheye. You will definitely want two strobes to get full light coverage in your frame. Use as much strobe power as possible to illuminate the soft corals and really make them shine. Fortunately soft corals don’t move so you can get as close as you want. Bracket, bracket, bracket and really work on your blue backgrounds. Get close to the soft coral with a fisheye lens. Fiji is a great place to get close to the coral and practise your wide-angle technique. Take you time, put your strobes on manual, and get your exposures right. Bring all your wide angle lenses and practice with them to see what you like best – Tokina 10-17, Nikkor 17-35, Nikkor 10.5, Nikkor 16. We are known affectionately as Sharkman and Mantagirl, each name referring to our favorite ocean critter though our passports say Ridlon and Carin Kiphart. Our passion is for everything under the waves. And like you, we are all about creating amazing underwater imagery and have been doing it around the globe for the past 15 years. We are founders of Ocean of Hope Foundation, a non profit foundation dedicated to restoring the health of the ocean through education in the US and abroad and Live Adventurously, a company dedicated to living life off the couch and helping others do the same through dive travel. As members of the Explorers Club, our passions are travel and diving and u/w imaging and exploration of the world’s most “amazing” places. Our favorite location is “off the beaten track”, our preferred roads are “unpaved” and our most beloved dive sites are “exploratory”. We’ve been to well over 100 countries and spend 8-10 months of the year on the road and under the waves. It’s the best life we can imagine. Submitted by Timothy (not verified) on Wed, 2011-06-29 05:25. Hi, I'm using Firefox and for some reason the fonts on your site are gigantic. All the other sites I usually browse show up normally except yours. There are many ways to train for the project management exam, and one of the best PMP exam prep courses I've come across is the PM PrepCast. PM PrepCast discount. This PMP training course has been used by thousands of people who successfully passed the PMP test after purchasing it. You can spend days reading boring project management books or you can get the PM PrepCast today! Submitted by Zig on Sun, 2011-07-03 23:02. I, too, am using Firefox (version 5.0), and it appears fine. Perhaps you could adjust the font size in Preferences. Submitted by michael (not verified) on Thu, 2010-12-09 13:49. Terrific writing, very informative. Thanks. You did not mention Astrolabe Reef, Kadavu area. Submitted by David Yang (not verified) on Tue, 2010-10-19 23:21. This is a very informative write-up; thank you. I would look forward to any supplemental write-up about other places in Fiji such as Kadavu/Great Astrolabe Reef. Submitted by douglasjhoffman on Sat, 2010-06-26 12:20.
love the stunning imagery and information. Thank you!